Welcome back, MNPS students and teachers. Hope everybody had a fantastic reprise last week. As my son has informed me throughout spring break, we now have 34 more days until summertime. While things might have quieted inside district school buildings, outside storms continued to rage over district initiatives, spending, and the 2018-2019 budget. I must also confess that I started this post before the events at Monday’s Budget/Finance Committee transpired. In fact, I almost scrapped this piece, but I believe there are some points that are extremely relevant to the ongoing conversation, and so, I’m getting this out. Look for a follow-up tomorrow. On Thursday and Friday of last week, Channel 5 investigative reporter Phil Williams began a series of reports showing MNPS was not following its own purchasing protocols and was continuing to utilize friends from the Northeast as primary resources for educational support. These reports come on the heels of an already heated debate over enrollment projections and next year’s proposed budget. In response to the heat, and I’m assuming anticipation of the upcoming news stories, the normally media-shy Director of Schools Dr. Shawn Joseph grabbed his microphone and hit the airwaves, making stops at Channel 2 and Channel 4, and even doing the podcast Nashville Sounding Board. All told, the Nashville community was given a whole lot to digest last week. It would take hours to dissect and put into context all of the information made available last week, but there are a couple of things I would like to point out. I’ve heard the argument raised that the majority of Dr. Joseph’s problems spring from a subpar communications platform. The argument being that policies and implementation just aren’t communicated well and so the perceptions become ones of incompetence and mismanagement. While I don’t fully buy into that argument, I’m willing to give it some credence. The district continually seems to communicate in a reactionary matter and is seldom proactive. Instead of telling parents about water issues, they wait for the story to break on the local news. Instead of alerting people to changes in free lunch programs, they wait for the story to break on the news. Instead of explaining enrollment shortfalls and the subsequent loss of funding, proactively they wait for the local news to break the story ahead of time. Once the story breaks, they cry fake news and inaccurate information and rush to defend themselves. In other words, they consistently allow somebody else to shape the narrative before they tell their story and then play the victim when the story doesn’t suit them. You would think that after two years of wash, rinse, repeat, that somebody would hold a meeting where an actual communications strategy was discussed and implemented. 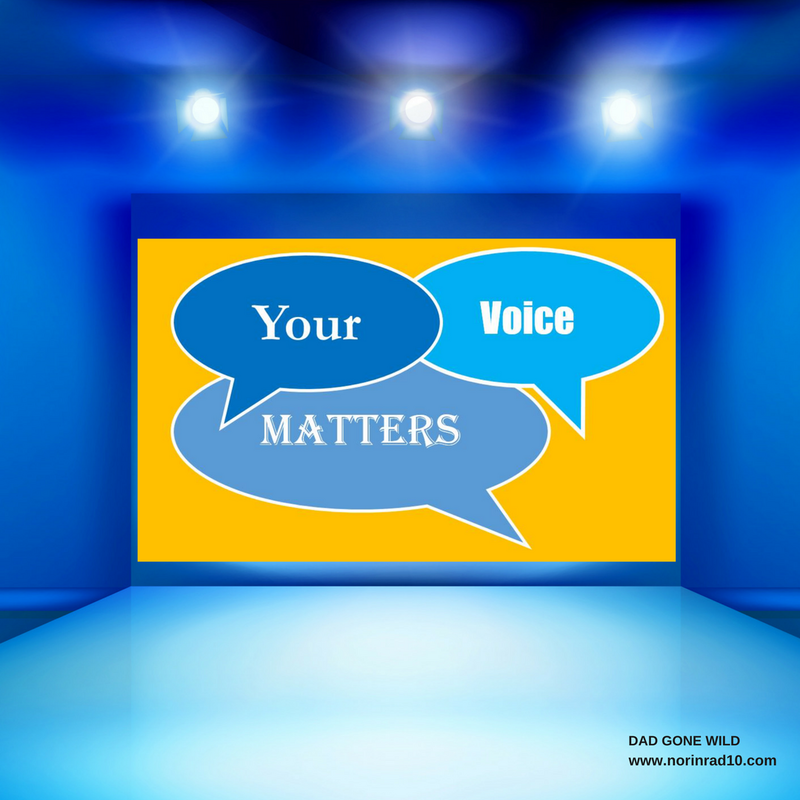 By now, somebody has surely realized that the actions of district leaders are being closely scrutinized, there are no secrets, and just hoping nobody notices is not a communications policy. Take this year’s budget process, for example. It’s been a dumpster fire when it didn’t have to be. Before administrators even discussed the upcoming budget and the revised Title I distribution with principals, they should have had all the exact figures in hand and those figures should have been fully vetted for accuracy. There should have been a sit down with a core group of senior principals where the plan was shared and those senior principals provided with an opportunity to stress test the plan. Then, accurate figures, with an accompanying narrative supporting the figures, could have been presented in a timely manner. If people took exception to the changes, the discussion could be based on verifiable numbers, instead of the plethora of changes that have left nobody sure of what figures were accurate. To this day, I have no faith in the numbers being tossed around. What?!? How is from $304,289 compared to over a million dollars trending flat? Furthermore, if you just started tracking UPRs in 2015, where was the money accounted for previously? Did it just turn up somewhere in the budget? When you say that 2018 is trending flat, are you talking about the fiscal year, which begins in July, or the calendar year, which began in January? Where does the money for UPRs come from? What’s the whole story here, and if there is nothing in William’s story for me to be concerned about, why are you not explaining it in more detail to me? And by the way, several of those UPRs are for 5-figures and above, so to utilize the examples of a teacher applying late for a conference or a maintenance worker picking up a part is a little bit disingenuous. A proper narrative requires telling the same story every time you repeat it. Dr. Joseph has pointed to the growth of advanced academics as a success this year, and to some extent, rightfully so. But in touting that success at various media outlets, he’s changed the story with each telling. On the radio, he stated that we’ve doubled the number of kids taking advanced classes throughout the district. At the State of Schools speech, it became “We have doubled the number of students with plans to take Advanced Placement, International Baccalaureate, and Cambridge exams, and we have expanded our advanced programming in middle schools.” On Channel 2 it was, “We doubled the number of kids taking advanced placement at the high school level.” All three claims are very different, and I’m not sure any of them can bear up to being fact checked. The one that probably comes the closest to being factual is that we’ve nearly doubled the number of kids taking Advanced Placement tests. The reason being that the district paid for those tests this year. So, if last year you had 100 people taking AP classes and 50 weren’t taking the test because they couldn’t afford it, it’s not a big stretch to imagine that if the financial barrier is removed, everybody will take the test. The district deserves accolades for removing that barrier. However, just like with testing the water for lead, it’s not enough to just take the test. What were the results? What are we doing with the results? We all purportedly hate participation trophies, yet’s here’s Dr. Joseph asking us to give him one. You have to do more than just test. Dr. Joseph is shouting MAP testing results from the roof tops. But again, we are not telling the whole story. First of all, we’ve chosen to completely disregard a whole testing session. Kids took the MAP test in November and scores were down 2%. Those results are no longer part of the conversation as we focus only on September and February testing results. That 2% drop in November was ruled insignificant. 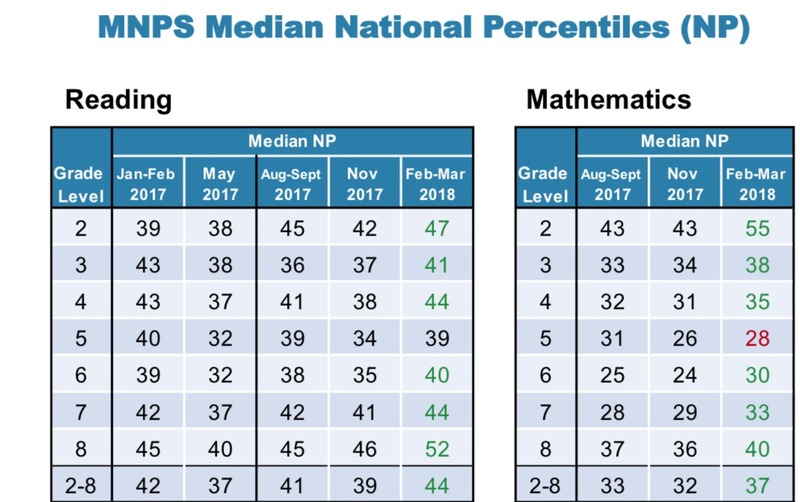 February scores are up 3% and being touted as the “highest they’ve ever been in MNPS,” which is not a true statement. As you can see by looking at the district-supplied chart of results from the last 5 applications, scores are basically flat with only 6th and 7th graders showing significant gains. I’m not trying to throw cold water on the work that teachers and kids are doing, but the numbers don’t lie. Why not brag about the math scores, which other than 5th grade, legitimately earn accolades. On Eagles’s podcast, Joseph touts MAP being given three times a year as a component of its power. Exactly when will we be giving the test three times this year? November’s results are disregarded and May’s testing window has been labeled optional, so when will the third administration be delivered? He can’t just keep saying whatever comes to mind. Furthermore, while touting these results, Dr. Joseph seldom outlines how we got them. At the school board meeting, he mentioned scripted curriculum, expectations, and the scope and sequence. Talk to any teacher about this year’s scripted curriculum and scope and sequence and then come tell me how those items produced these results. I’ll tell you what actually produced those results and district leadership won’t like it. Teachers. Teachers who ignored the district’s initiatives and just did what they knew to be best for kids. Which is very commendable, but how do we replicate the results? Again, we have the refrain of it’s the testing that matters, not what you do with the results. I could go on and point out endless examples. The short answer is, yes, many of Dr. Joseph’s problems stem from a communication root. But I’m loathe to just write it off as that because when I look at the Channel 5 reports, there is no denying that missteps have not hurt the bottom line for the friends and families of the Chiefs from Prince George’s County. 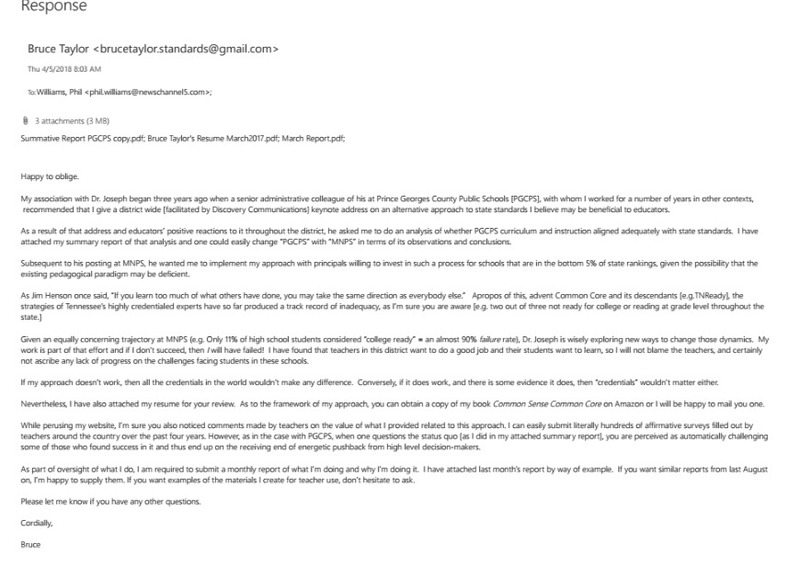 I’m going to leave this aspect alone for today other than to say, faulty communication supplies an all too convenient excuse for problems that are plaguing the current MNPS administration, but it doesn’t cover up that people from PGCPS have benefited disproportionately from district policy compared to those who were already employed upon Dr. Joseph’s arrival. Let’s just say I’ll be revisiting this topic later in the week. However, I can’t close out this portion of the conversation without sharing the thoughts of Thespian Bruce Taylor. Taylor is a compatriot from Prince George’s County who, despite having no formal training in education, has managed to secure a $100k contract to work with 2 schools on ACT improvement. Two middle schools, I might add. Taylor admits that he has no formal training in education, but provides this argument in defending his qualifications: “If my approach doesn’t succeed, then all the ‘credentials’ in the world wouldn’t work.” Conversely, if it does work, and there is some evidence that it does, then “credentials” wouldn’t matter either. Based on that logic, I don’t know why teachers bother getting their degrees. Why does the state even require certification? I encourage everybody to read Mr. Taylor’s insights and then I suggest y’all quit and set up a consultancy agency. $100k is a damn sight better than a teacher’s salary. The community gets a chance to weigh in on the budget again this week. Tonight is a budget hearing at 5 pm, with another tomorrow after the board meeting at 6 pm, and then one last opportunity Thursday at 5 pm. I encourage everyone to show up and speak out. Positive and negative. Tomorrow is a regularly scheduled board meeting at 5 pm. One thing that stands out on the agenda is that there will be a vote on the recently negotiated Memorandum of Understanding between the district and teachers. While most of the fiscal components have been deferred to the compensation committee, there are still some things to celebrate. The length of the working day has been defined, as well as the procedure for appealing reprimands. It may not be a giant step for mankind, but it is a step forward. Thanks to all of those who worked so hard in bringing this to fruition. There is good news coming out today from the Tennessee Department of Education. They are doing away with 2 state tests at the high school level. Tennessee Commissioner of Education Candice McQueen’s 30-member assessment task force made separate votes on the recommendations, both with the same conclusion. In the 2018-2019 school year, the Chemistry test and English III test will no longer be administered. “Keeping students at the center, teachers want fewer tests in that year. That’s how we support them,” said Cicely Woodard, a Nashville public schools teacher and member of the committee. Call this one a step in the right direction. Get ready. Come April 10, NAEP will be releasing its latest results. Will Tennessee continue to be the fastest rising state in the union? Last week’s poll numbers were down a little bit. Not sure if it was that you didn’t like the questions, or you didn’t like the column, or you were just checked out on spring break. Either way, I promise to do better. Still, some meaningful information can be drawn from your replies. So let’s look at them. Don’t think they can. Check the fine print at MNEA. Don’t let Joseph and his minions get 5 years in TCRS! It was disastrous when we had it. Unfunded and low student turnout. Will they be able to stomach funding transportation and food? If not, then NO. I think it will be hard to get teachers to work it. I don’t know enough about the candidates yet. Don’t know enough about any of them. What is the position of these candidates on education? That’s another one in the bag. Seeing as tonight was particularly eventful for the school board, I suspect I’ll be back tomorrow. If you need to contact me, you can do so at Norinrad10@yahoo.com. I’m always looking for more opinions and try to promote as many of the events that you send to me as possible, but I do apologize if I fall short and don’t get them all out there. So I just watched the exchange between the Doctor and Board Member Amy Frogge. Well unprofessional, discourteous and disturbing are the words that come to mind when I see/hear that exchange. Then the threat of lawsuits. Okay thank you. Better watch out TC you will be served apparently for asking questions, examining documents and credentials and demanding answers. The next word comes to mind is petulant. How dare you demand things from me arrogance that I watched with the smirking and eye rolling I thought I was in a high school class. Yikes. Will Channel 5 News be sued also as they were the ones who got this ball rolling so Phil Williams better make sure he’s lawyered up! The last statement is also telling “I didn’t do anything illegal” Did anyone say that he did do anything illegal or even infer that? Inappropriate, idiotic and unauthorized but I had not heard that other “I” word mentioned. To put it bluntly that was WIERD. I had an alarming/sad/discouraging encounter with some high school seniors the other day. They thought the “Doctor” was doing great they heard nothing negative and believed he was doing a good job. Only one of the kids sort of knew his same but was not sure. But none of them knew where the Board was or where the school headquarters were located nor well much of anything about current elections or even where an excellent community resource – Casa Azafran – was located with regards to early voting, etc. But they did know the excellent Red Bicycle coffee shop so I thought that was a plus. The lack of civic engagement, knowledge and familiarity with current events that affect their community shows that testing is really not helping build community or knowledge. This is why we see activism in schools and places where money and privilege matter and for the rest not.so.much. The oversight of the board is a response to their constituents and community. They in turn act upon their best interest and in turn have to make decisions that will in fact do as such. When we have graduating Seniors in High School unaware of how to register to vote, where to vote and let alone where the offices are that make decisions on behalf of them it makes you worry. I am.